Heattec systems, high-watt density cartridge heaters are fully swaged and can be applied wherever high-temperature cartridge heaters are used. 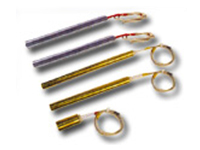 Cartridge Heaters provide superior heat transfer with uniform temperature and resistance from oxidation and corrosion at high temperatures. Heattec systems are available in low, medium and high watt densities with internally externally connected leads. High-grade nickel chromium resistance wire. Stranded leads with silicon-impregnated mica glass insulation, or swaged in. Special sizes, wattages, and materials are available upon request. Custom-designed to meet your specifications. Food service and medical equipment. Easy and economical to install.